Update: Bar Tartine has changed chefs. The meal below was served when the kitchen was run by Jason Fox. Nothing is better than having a great meal at a restaurant then returning months later and having an even more impressive meal. Bar Tartine is currently at the top of my list for a fine dining meal. On a Saturday evening, we enjoyed the Sun Marin Farms Shank Marrow and Grilled Walnut Bread, Grilled Sardines over blood orange salad, Roasted Lamb and Duck breast with Foie Gras Agnolotti, Cheese Course and a Lemon Trifle. 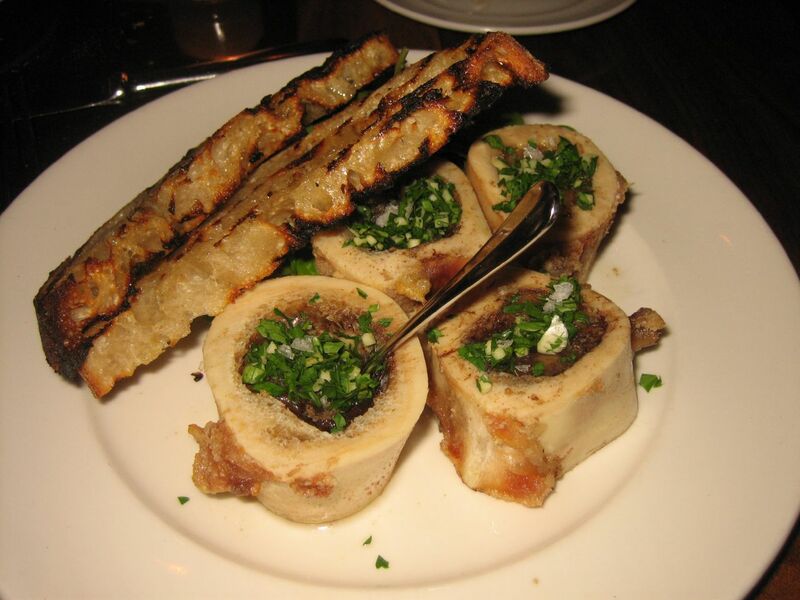 The marrow was a dish I had previously ordered and it was as delicious as before. The soft rich marrow mixed with sea salt and scooped onto caramelized walnut bread is something I will likely order every time I come here. M enjoyed the grilled sardines and felt the citrus flavor and peppery salad complimented the light sea flavor of the fish. I felt the fish was not as strong in sea flavor as I prefer, but the salad would be a good as a light starter on a warm summer evening. The roast lamb consisted of two different cuts of lamb, one from the rib and the other from the loin. They were prepared the same way and in a savory brothy sauce that allowed the natural taste of the lamb to shine through. 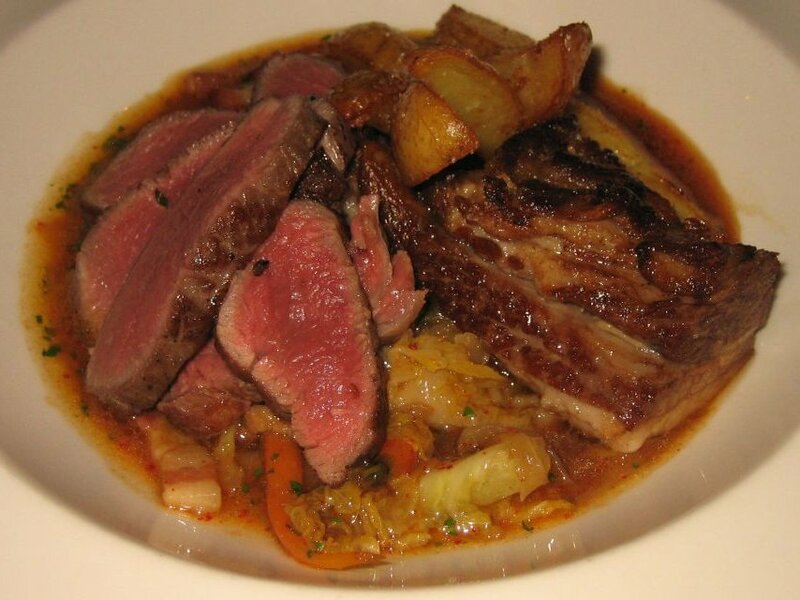 The two cuts of lamb had distinct flavors. One was lighter and the other was gamier, a very nice contrast that was highlighted by the preparation. I would not hesitate to order this if I found it on the menu again. That is, if they aren't serving the duck breast with foie gras agnolotti. The duck breast was a cut in the shape of a long roll with the duck skin crisped and covering the top of the meat. It lay on a thin yet rich sauce and had several foie gras dumplings surrounding it. 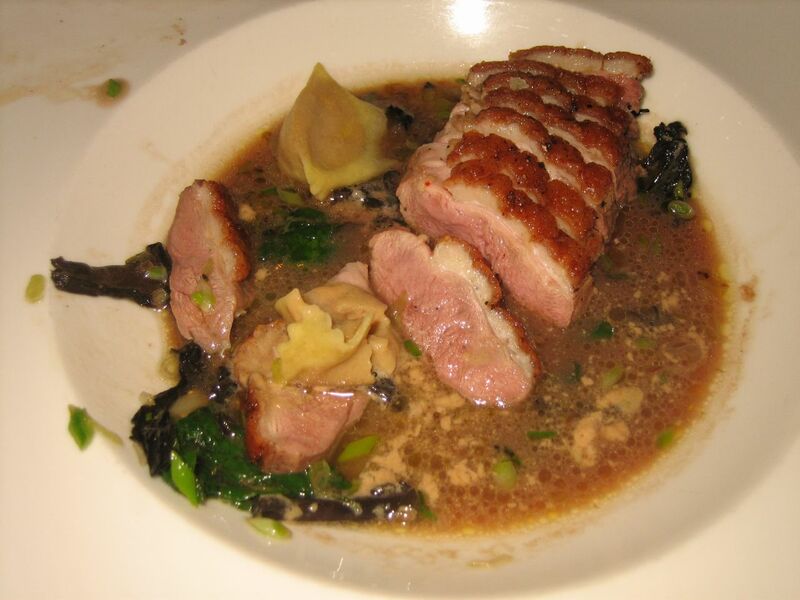 The duck breast was soft and tender while the skin added a crunchy smokey texture. Together with the sauce this would have been a wonderful dish. Then, I placed a dumpling on top of a slice of duck and cut it open. Out oozed foie gras onto the duck and into the surrounding sauce. One bite and I found myself making an involuntary yum sound. I immediately prepared a slice for M to try -- same reaction. Despite the decadence of the ingredients, I easily finished the entire dish. I love this cooking, simple recognizable ingredients, yet luxurious and completely focused. One of the best dishes I've had in recent memory. We were full and satisfied, but couldn't bear to end the meal. The restaurant is so comfortable, the service friendly and gracious, we went on to have both a cheese course and dessert. The cheese course came with the three cheeses which I failed to note and accompaniments: fuji apple slices, marcona almonds, quince paste cut into triangles and local honey with honeycomb. 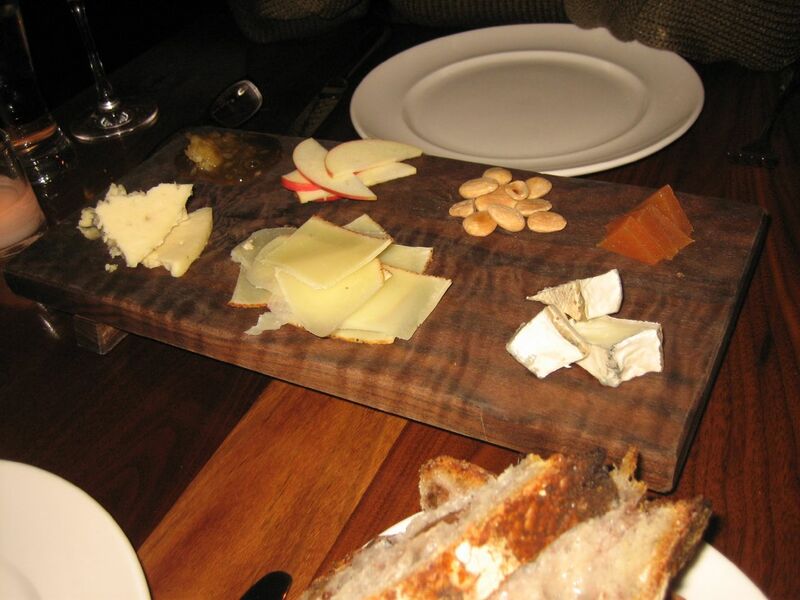 I particularly liked pairing the quince paste or the honey with two of the cheeses. We also enjoyed the lemon trifle dessert, but this was the one course that was not a strong as the rest of the meal. Perhaps my expectations are high for desserts, knowing how good the sweets are at their bakery. Or maybe I was just too full to appreciate it. I remember really enjoying the breakfasts at Zazie years ago, but not enjoying the long wait. Luckily there was no wait on a Friday morning. I started with the French Onion Soup, which was decent. A heaping of (gruyere?) cheese thick and melted over a baguette slice and beefy onion soup. The soup was full of flavor, but it would've been nice if there was a little less bread inside the bowl. 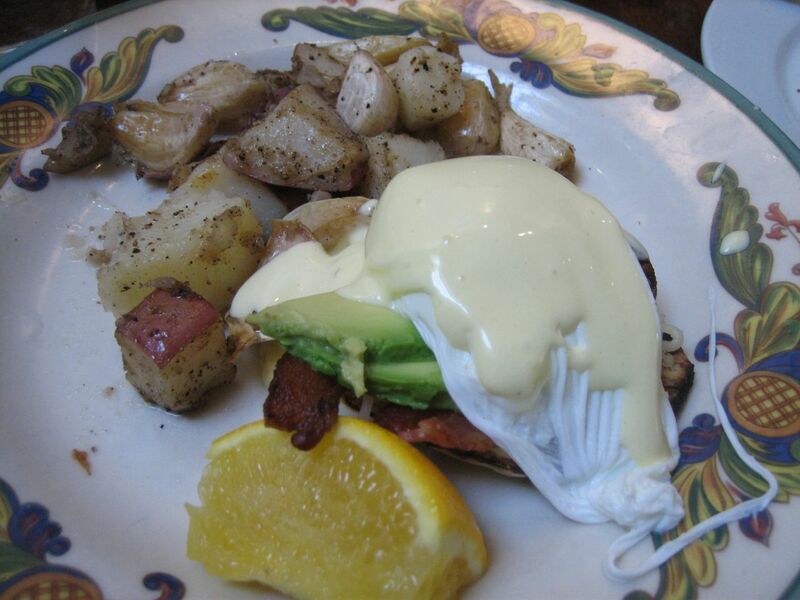 The benedict was as good as I remembered, very lemony hollandaise sauce and thick smokey bacon hit the spot. 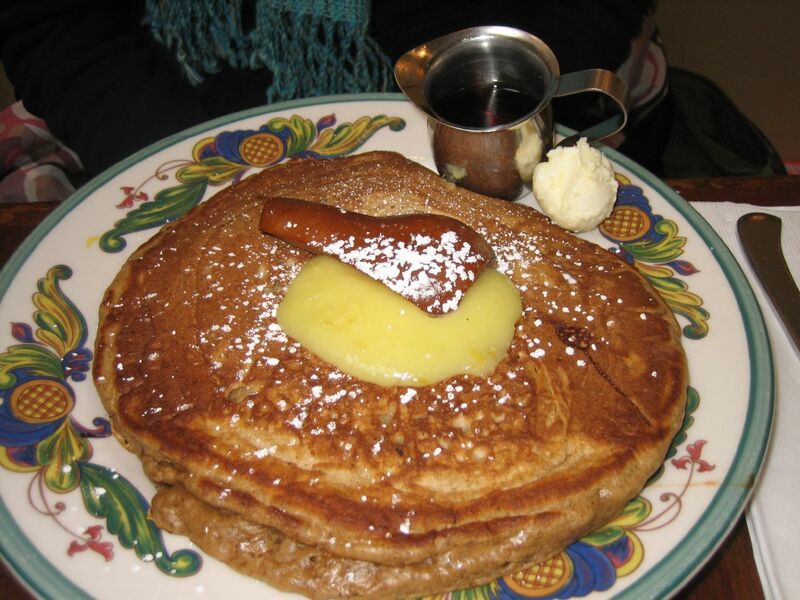 Much less satisfying were the ginger pancakes which were extremely thick, heavy and far too moist. Perhaps a little undercooked, but then the thickness was seemed intentional, so I'm not sure. I would definitely not order that again. My overall impression was positive. The service is friendly, but somewhat slow because they seem a tad understaffed. The room and the back patio are the biggest draws. A very nice environment to enjoy a relaxing brunch though, I would not wait in lines for it. With Boulange de Cole nearby, it's a lot easier to have a backup plan to avoid a line. A satisfying lunch of Yuke Jang at Shin Toe Bul Yi. 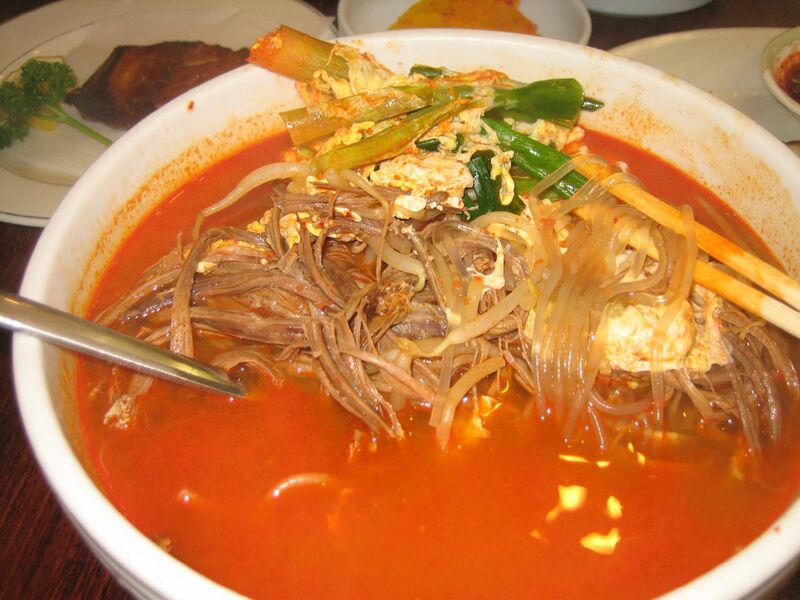 Yuke Jang is beef brisket in a spicy soup with egg and green onions. 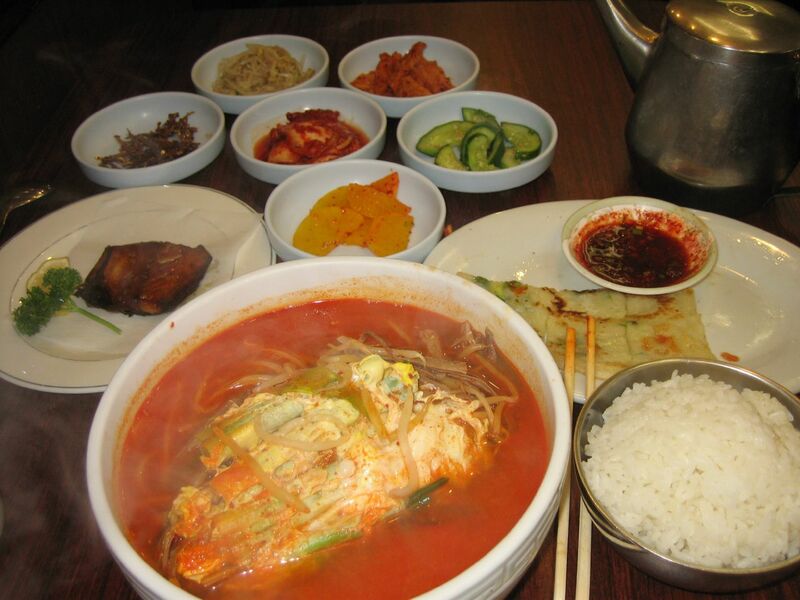 STBY's has great soups and stews, so I thought I'd give their Yuke Jang a try. The soup was excellent spicy with a deep beef broth base. The egg and bit of clear noodles were good, though I felt they went a little over the top with the green onions. The beef itself was the right cut, though a little stringier than I like. Still it beats the last time I ordered Yuke Jang (at a Korean bbq restaurant) and got soup with some random pieces of beef in it. The service here is very homey. They always serve mackerel and ha mul pa jun (pancake) with the pan chan which is not always given freely at other places. I spent part of the holidays in Napa, so I had to try one of the fine dining restaurants in Yountville. We joined the early Saturday night dinner service at Redd. The dining is a modern and warmed with cherry wood paneling. The service was professional, efficient though not particularly warm. The table was provided some bread and very good butter. Unfortunately the bread seemed a bit stale, though it may have just been the fact that it was served slightly below room temperature. Out of a party of six, three of us wanted to order the tasting menu, but alas, the server informed us that restaurant's policy is that the entire table must order the tasting menu. So we opted for a variety of dishes: Diver Scallops, Tasting of Foie Gras, Butternut Squash Soup, Glazed Pork Belly, Autumn Salad, Duck Breast, Prime New York Steak and Chicken. 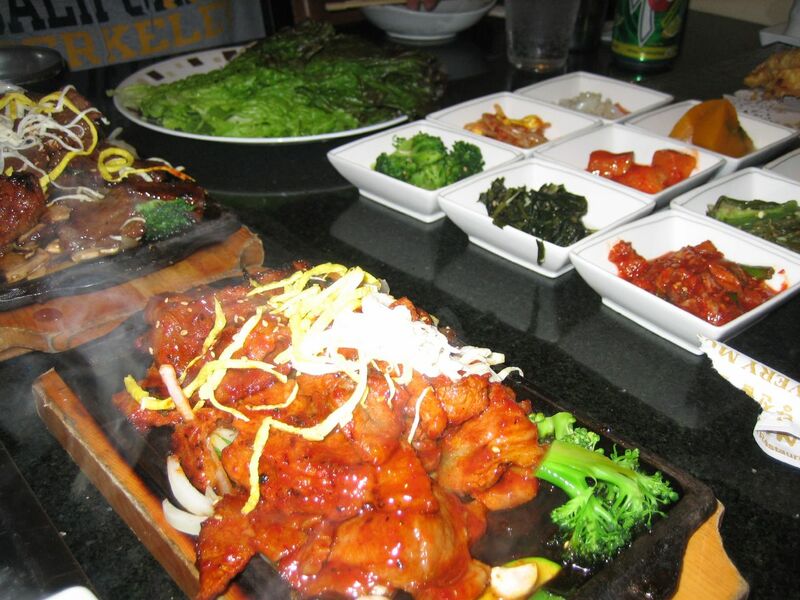 I was surprised by the size of the main dishes, the duck, steak and chicken were servings big enough for two. It has been too long for me to comment on the details of each, but all of them were of high quality. None of them were particularly unusual or made an special impression on me. Of the three, I would order the duck again. The standouts for me were the Diver Scallops, the Glazed Pork Belly and the desserts. I wish I could remember more of the dinner, but my general impression was that the meal was fine though I'd like to try other places in Yountville before coming back. 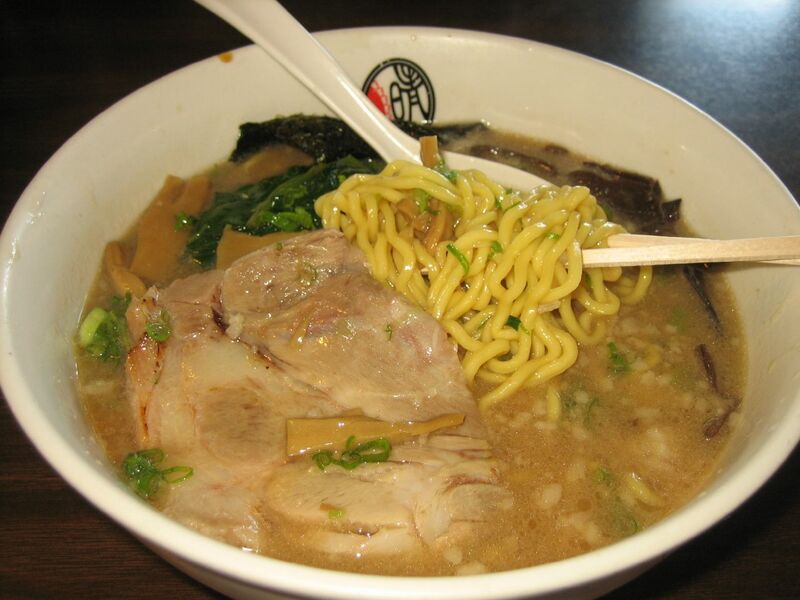 The ramen noodles at Ramen Halu in San Jose were the best I've had in the Bay Area, thicker than the usual noodle, chewy and flavorful. The smallish restaurant was crowded on a weekday lunch hour, but the service was fast enough that the wait was minimal. The signature Ramen Halu had a broth thick with protein and delicious drippings from the cha shiu, but it was too salty for my taste. The saltiness covered any depth or subtly that might have been in the soup. Yes, judging from the Japanese looking clientele packing the place, I might be the only one with this opinion of the soup. The cha shiu was very tender and had a good ratio of meat to fat, the pickled shoots were fresh and crunchy. The fresh noodles are enough to make me return, but next time I'll order a different soup. I was lucky enough to join some sushi expert friends for omakase at Sebo on a weeknight. We arrived for the first seating of the night so it was relatively quiet, only three or four parties in the house. The first thing that struck me was the very warm decor of the place, lots of cherry wood paneling and low lighting. A comfortable place for a long relaxed meal with friends. Sitting at the bar, we started with some sashimi before moving on to some interesting nigiri. The quality and variety of the fish was excellent as was the Japanese sushi chef. He was very friendly, carefully describing each piece and tailoring the meal to impress us. We will definitely return.